Heading into a new year it’s always nice to take a moment to reflect on projects we worked on the past twelve months. For this blog, we asked our Project Designer, Kelsey, to share with us her five favorite things she incorporated into her original designs throughout this year. Lighted mirrors are unique, provide even lighting for makeup application, and give the room a luxury feel since you often see them in high end commercial bathrooms and hotels. These mirrors were great for the overall design because we were working within two set upon cabinets, which limit space for vanity lighting. 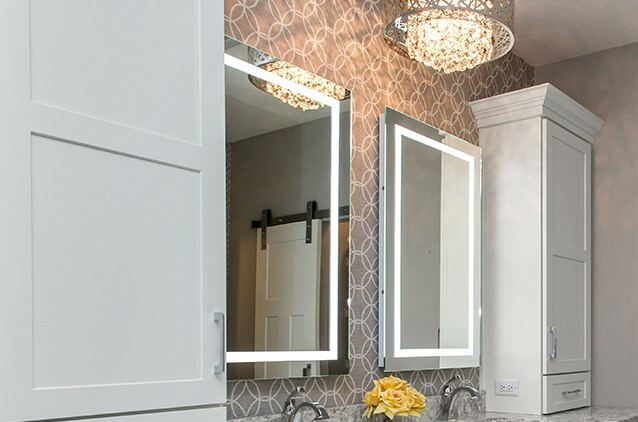 The lighted mirrors also added function to the design because the homeowner really wanted a fun chandelier, but it wouldn’t provide adequate lighting alone. Another unique feature with a cool look. This type of hardware helps limit the amount of metal hardware on the overall shower design. 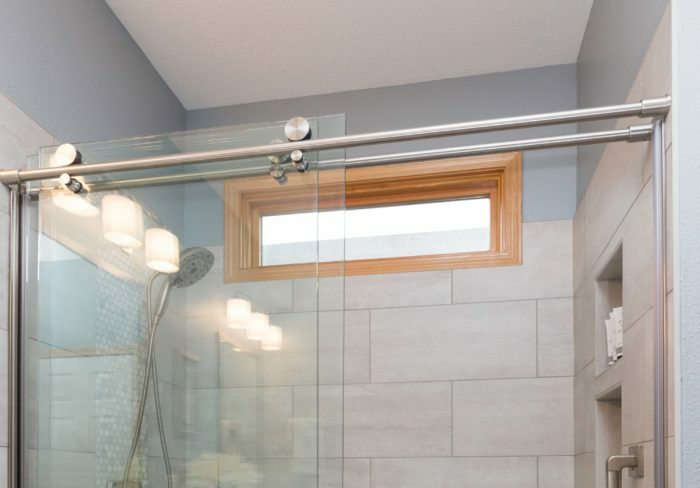 Sliding doors are great when a space doesn’t allow enough clearance for a swing out door, and this hardware is an interesting departure from traditional frameless shower door hardware. 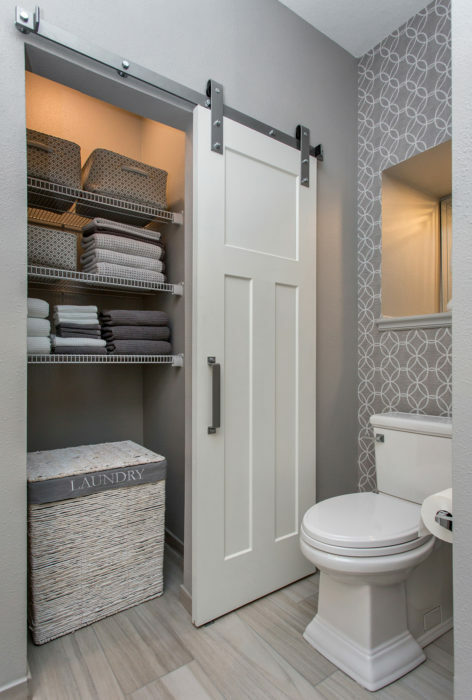 While these doors have an industrial feel, they are pretty streamlined overall, so are easy to work into many design styles and could tie together a transitional style bathroom. Wallpaper is still a fun way to make a space truly unique and show your personal style. It’s a great way to add a pop of color or just visual interest to an accent wall. By no means do you want it everywhere, but a wall or two within a space can really add wow to an otherwise “boring” space like in this toilet niche. For those of you who have sworn off wallpaper because you struggled to remove it, newer wallpaper formulas are supposed to be easier to remove when you decide to make a change, as long as they are installed correctly. 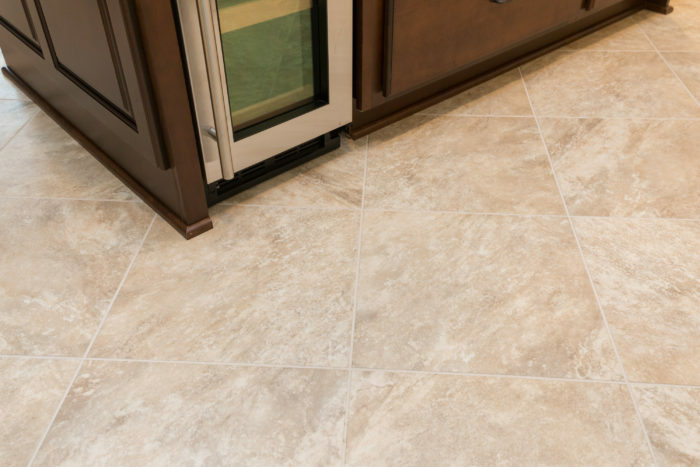 I LOVE LOVE LOVE this luxury vinyl tile kitchen floor for a couple of reasons. First, it goes great with the homeowners’ more traditional style. 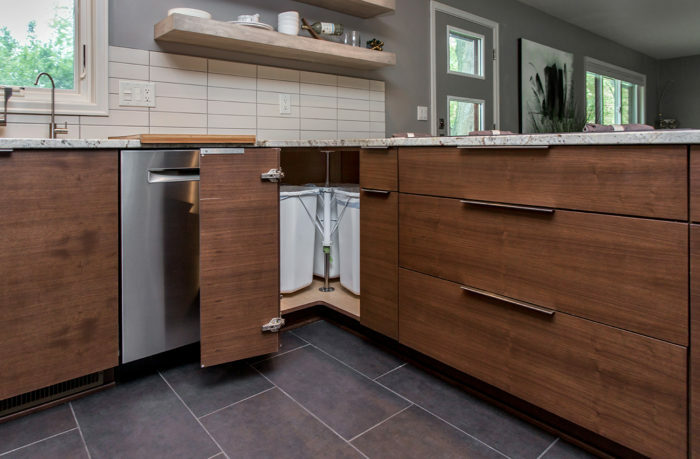 And since they have a crawlspace beneath their kitchen, LVT is a nice soft and warm alternative to hard surface tile that could feel cold. I loved it so much in their design because once it was installed, the space felt much brighter and inviting. I also love LVT because it can be grouted to truly give the appearance of tile. What are your favorite things? If your home isn’t one of them, maybe a remodel can help. Our team can help you love your home! Contact us for a free consultation, or register for one of our Kitchen and Bath Remodeling Seminars.